00:27:00 Makes 4 servings, 1 burger (248 g) each. Makes 4 servings, 1 burger (248 g) each. Bronco Burger, anyone? 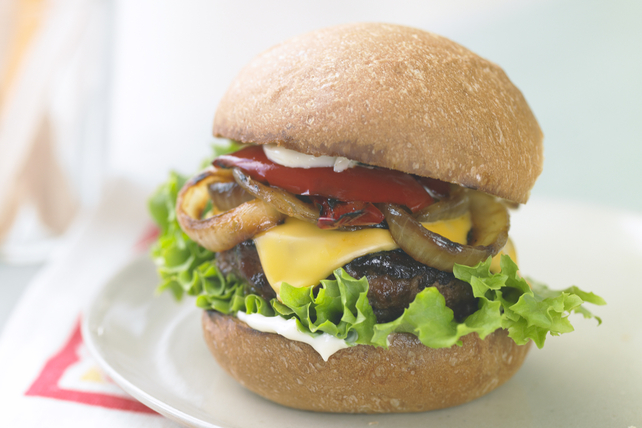 These homemade beef burgers are topped with cheese slices, caramelized onions and charred peppers. Smoky barbecue sauce and tangy MIRACLE WHIP round out the flavours, ensuring rave reviews for these tasty burgers. Mix meat, egg and 2 Tbsp. barbecue sauce; shape into 4 patties. Grill patties, peppers and onions 5 min. on each side or until burgers are done (160ºF) and vegetables are softened and lightly charred, brushing burgers and vegetables occasionally with remaining barbecue sauce. Top burgers with Singles; grill 1 to 2 min. or until melted. Meanwhile, place buns, cut-sides down, on barbecue; grill until toasted. Spread buns with Miracle Whip; fill with lettuce, burgers and vegetables. For added colour, use half each of a red and yellow pepper. Serving Size Makes 4 servings, 1 burger (248 g) each.